Notes: Olavinlinna (Swedish: Olofsborg; literally St. Olaf's Castle, see Olaf II of Norway) is a 15th-century three-tower castle located in Savonlinna, Finland. It is the northernmost medieval stone fortress still standing. The castle is built on an island in the Kyronsalmi strait that connects the lakes Haukivesi and Pihlajavesi. Olofsborg withstood several sieges by the Russians during the First and Second Russian-Swedish wars. 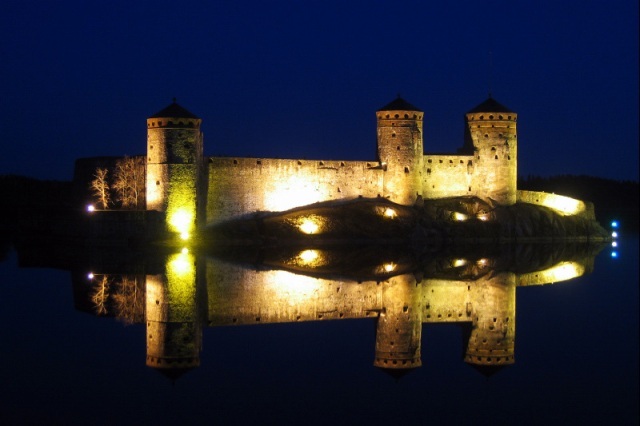 A brisk trade developed under the umbrella of the castle towards the end of the 16th century, giving birth to the town of Savonlinna, which was chartered in 1639. On 28 July 1714, the garrison capitulated to the invading Russians, and it took them only two days to take the castle in 1743, in the events leading up to the Treaty of Abo which awarded the entire region to Empress Elizabeth of Russia.The castle hosts several small exhibitions, including the Castle Museum which displays artifacts found in the castle or related to it, and the Orthodox Museum which displays icons and other religious artifacts both from Finland and Russia. The castle forms a spectacular stage for the Savonlinna Opera Festival, held annually in the summer since 1912. Olavinlinna is the initial model for Kropow Castle in the comic book King Ottokar's Sceptre, an album in the series of Adventures of Tintin created by Herge.